The elbow joint displays an elegant balance between stability and mobility. While allowing a wide range of motion, the joint has an inherent stability that requires a considerable force to dislocate. As a result, a significant percentage—approximately one third of elbow dislocations—are associated with fractures of bony components of the elbow. Dislocations without associated fracture are termed simple, while dislocations with accompanying fracture are termed complex. Dislocations of the elbow fall in frequency just behind dislocations of the finger and shoulder. Most commonly, the elbow dislocates posteriorly. Immediate reduction is essential to reduce the risk of neurovascular or cartilaginous complications. 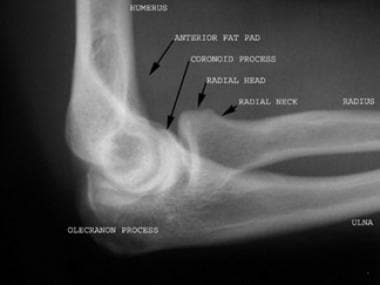 Anteroposterior radiograph of the elbow demonstrates the normal anatomy. 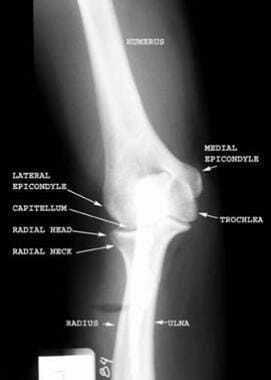 Lateral radiograph of the elbow demonstrates the normal anatomy. Both posterior dislocations and anterior dislocations can occur. A fall onto an extended abducted arm is the mechanism of injury seen in posterior dislocations of the elbow. An example of this is someone rollerblading who, falling backward, extends an arm behind to break the fall. Posterior dislocations account for most elbow dislocations. Closed posterior dislocations are not commonly associated with neurovascular injury. Lateral view of the elbow demonstrates a posterior dislocation of the elbow. The patient also had a nondisplaced radial head fracture. A strong blow to the posterior aspect of a flexed elbow may result in anterior dislocation of the elbow. This force drives the olecranon forward in relation to the humerus. Anterior dislocations and any open fracture are commonly associated with disruption of the brachial artery and/or injury to the median nerve. Elbow dislocation injuries occur more often in males than in females. Dislocations occur more commonly in adults, since the same force in children more often results in a supracondylar fracture of the distal humerus. Up to 10 degrees limitation in full extension and some limitation in flexion are common, unless an intensive rehabilitation program is instituted. For patient education resources, see the Breaks, Fractures, and Dislocations Center, as well as Elbow Dislocation and Broken Elbow. Ayel JE, Bonnevialle N, Lafosse JM, Pidhorz L, Al Homsy M, Mansat P, et al. Acute elbow dislocation with arterial rupture. Analysis of nine cases. Orthop Traumatol Surg Res. 2009 Sep. 95(5):343-51. [Medline]. Jacob A, Khan S. Radiology of acute elbow injuries. Br J Hosp Med (Lond). 2010 Jan. 71 (1):M6-9. [Medline]. Sheehan SE, Dyer GS, Sodickson AD, Patel KI, Khurana B. Traumatic Elbow Injuries: What the Orthopedic Surgeon Wants to Know. Radiographics. 2013 May. 33(3):869-888. [Medline]. Murphy RF, Vuillermin C, Naqvi M, Miller PE, Bae DS, Shore B. Early Outcomes of Pediatric Elbow Dislocation-Risk Factors Associated With Morbidity. J Pediatr Orthop. 2015 Nov 3. [Medline]. Modi CS, Wasserstein D, Mayne IP, Henry PD, Mahomed N, Veillette CJ. The frequency and risk factors for subsequent surgery after a simple elbow dislocation. Injury. 2015. 46 (6):1156-60. [Medline]. Schreiber JJ, Potter HG, Warren RF, Hotchkiss RN, Daluiski A. Magnetic resonance imaging findings in acute elbow dislocation: insight into mechanism. J Hand Surg Am. 2014 Feb. 39 (2):199-205. [Medline]. Reed MW, Reed DN. Acute ulnar nerve entrapment after closed reduction of a posterior fracture dislocation of the elbow: a case report. Pediatr Emerg Care. 2012 Jun. 28(6):570-2. [Medline]. Anakwe RE, Middleton SD, Jenkins PJ, McQueen MM, Court-Brown CM. Patient-reported outcomes after simple dislocation of the elbow. J Bone Joint Surg Am. Jul 2011. 93(13):1220-26. Ali FM, Krishnan S, Farhan MJ. A case of ipsilateral shoulder and elbow dislocation: an easily missed injury. J Accid Emerg Med. 1998 May. 15(3):198. [Medline]. Bell S, Salmon J. The management of common dislocations in the upper limb. Aust Fam Physician. 1996 Sep. 25(9):1413-5, 1418-23, 1425, passim. [Medline]. 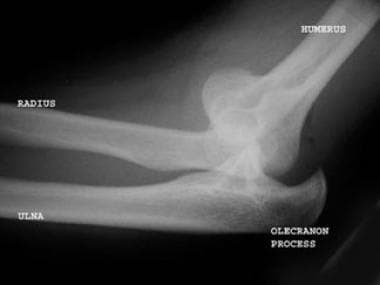 Cohen MS, Hastings H. Acute elbow dislocation: evaluation and management. J Am Acad Orthop Surg. 1998 Jan-Feb. 6(1):15-23. [Medline]. Gillingham BL, Wright JG. Convergent dislocation of the elbow. Clin Orthop Relat Res. 1997 Jul. (340):198-201. [Medline]. Haddad FS, Cobiella CE. Isolated radial head dislocation in an adult: case report and review of the literature. J R Coll Surg Edinb. 1997 Jun. 42(3):207; author reply 208. [Medline]. Hems TE. Isolated radial head dislocation in an adult: case report and review of the literature. J R Coll Surg Edinb. 1997 Jun. 42(3):207. [Medline]. Kuhn MA, Ross G. Acute elbow dislocations. Orthop Clin North Am. 2008 Apr. 39(2):155-61, v. [Medline]. Maxwell AJ. Isolated radial head dislocation in an adult: case report and review of the literature. J R Coll Surg Edinb. 1997 Jun. 42(3):207-8. [Medline]. Noyez JF. Isolated traumatic posterior dislocation of the radial head: a report on two cases. Acta Orthop Belg. 1996 Sep. 62(3):148-50. [Medline]. Rettig AC. Elbow, forearm and wrist injuries in the athlete. Sports Med. 1998 Feb. 25(2):115-30. [Medline]. Ring D, Jupiter JB. Fracture-dislocation of the elbow. J Bone Joint Surg Am. 1998 Apr. 80(4):566-80. [Medline]. Sachar K, Mih AD. Congenital radial head dislocations. Hand Clin. 1998 Feb. 14(1):39-47. [Medline]. Seijas R, Ares-Rodriguez O, Orellana A, Albareda D, Collado D, Llusa M. Terrible triad of the elbow. J Orthop Surg (Hong Kong). 2009 Dec. 17(3):335-9. [Medline]. [Full Text]. Shearman CM, el-Khoury GY. Pitfalls in the radiologic evaluation of extremity trauma: Part I. The upper extremity. Am Fam Physician. 1998 Mar 1. 57(5):995-1002. [Medline]. Sugimoto M, Yoshida T, Kitano K, Hosoya T, Tada K. Voluntary dislocation of the radial head. J Shoulder Elbow Surg. 1996 May-Jun. 5(3):228-30. [Medline].